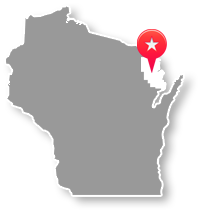 Marinette County is ideally located in Northeast Wisconsin on the shores of Green Bay bordering the Upper Peninsula of Michigan. State and County parks provide restful, scenic surroundings to spend liesure time. Endless trails provide recreation for adventurers who desire to ATV, snowmobile, hike, bike and cross country ski. Over 230,000 acres of county forest land are available for hunting and exploring wildlife. Exceptional inland waters include acres of lakes and miles of trout streams for the canoe, kayak and fishing enthusiasts. With its extensive recreational facilities and vacation advantages, Marinette County is truly an outdoor paradise! Marinette County Highway ATV/UTV Routes are Closed from December 1, 2018 to May 1, 2019. Marinette County Launches NEW Tourism Website! Marinette County Launches NEW Parks Camping Reservation Website!